Twitter has released some analytical stats that reveal how much of a rocketing success story it is: Forget rumors Twitter has plateaued–Tweeps are now Tweeting over 600 times every second. The sheer volume of that data is astonishing. But can Twitter monetize all this activity? So, we have 5000 Tweets per day in 2007, with relatively few users exchanging information, and only just beginning to flesh out Twitter’s capabilities. 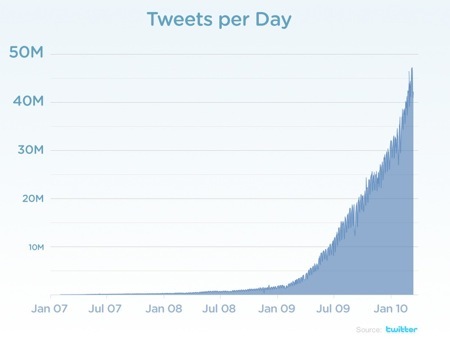 In 2008 more people were aboard, Tweeting 300,000 times per day. Last year, 2009, 2.5 million Tweets went out each day, and Twitter itself evolved: People were re-Tweeting, inventing phenomena like #musicmonday and #followfriday (which actively helps expand the social network) and linking their profiles into Facebook. Twitter began to seriously appear in the public’s eye. In December came the great Google feed live switch-on, which definitely bumped Twitter’s public profile even more. And right now Twitter’s shepherding a flock of 50 million Tweets per day, 600 per second. Assuming the average Tweet is about 100 characters, that amounts to 5 billion characters per day–an astonishing wellspring of fresh new content. No. Now’s the time for Twitter to really roll out its business analytics, those premium paid services that Biz Stone described last year. At 50 million Tweets a day, many of them containing useful links and opinion data, and with more and more companies using Twitter for PR and customer liaison, its obvious Twitter’s status stream has reached critical mass. Update: With perfect timing, a huge new rumor has popped up concerning Twitter’s revenue-generating future. According to CEO and co-founder of socialmedia.com Seth Golstein, Twitter’s on the verge of rolling out a new ad platform. Quizzed on the matter, Twitter’s head of product management and monetization Anamitra Banerji refused to say more, but did confirm an advert platform was under development and was in active testing. So much for Biz Stone’s stance on an ad-free Twitterverse.